Are you expecting a little addition to your family or have a loved one who is? One of the best things about prepping for a new baby to enter the world is the getting to plan a baby shower! We’ve already shared a few of our tips for how to throw a baby shower on a budget, but there are so many options for themes, food, games, and lots of fun decorating ideas. 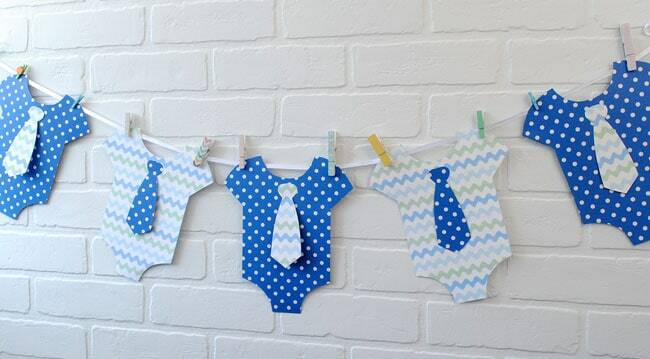 Today we wanted to share our favorite BOY baby shower ideas. Have a scroll and see if any of these ideas inspire your next shower. 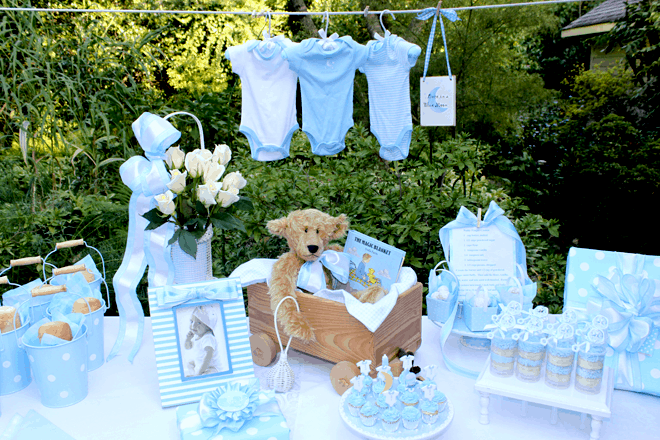 When choosing a baby shower theme, consider the parents’ or at least the mom’s interests. Does she love to read? Maybe a literary theme would be good. 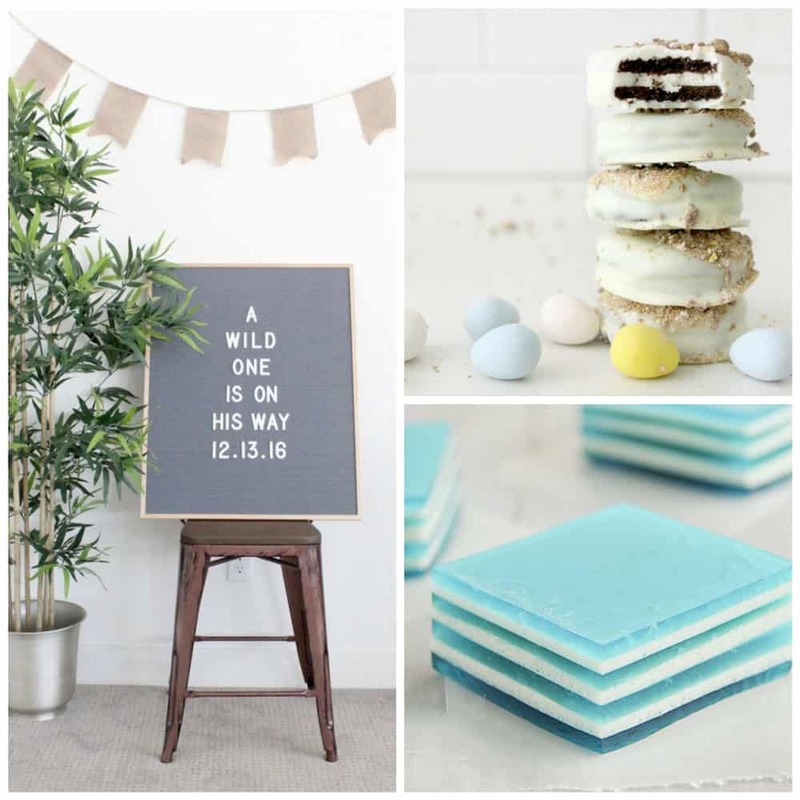 Would she love a unique baby shower theme, or should you keep it classic with lots of blue? It’s a hard choice, but a fun one. I think any of these themes below would be winners! 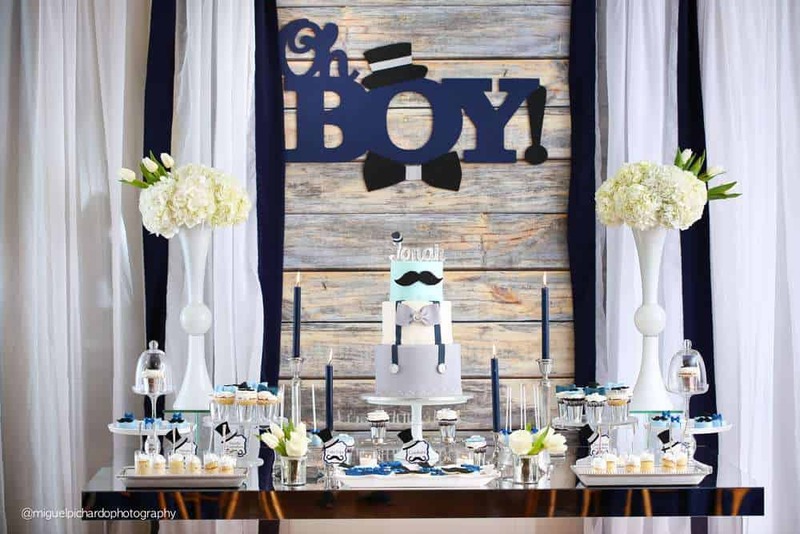 Courtney from Pizzazzerie is a party genius, and I LOVE everything about this Blue Moon boy baby shower theme! 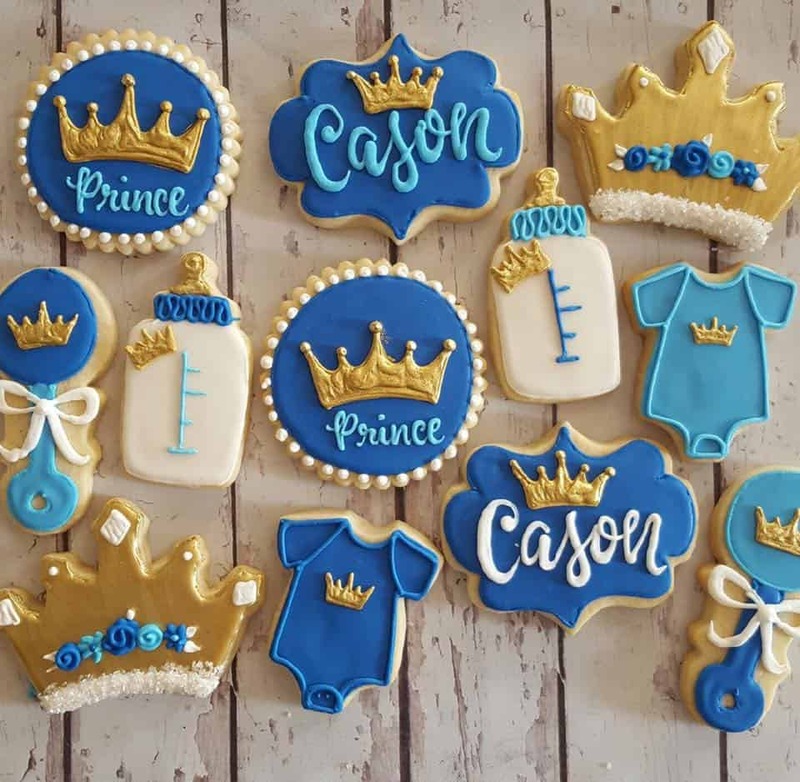 I love the idea of a prince baby shower theme! How cute are these sugar cookies from Haley Cakes & Cookies? If you’re not feeling inspired by those “classic” ideas, maybe try something a little more classy in general. 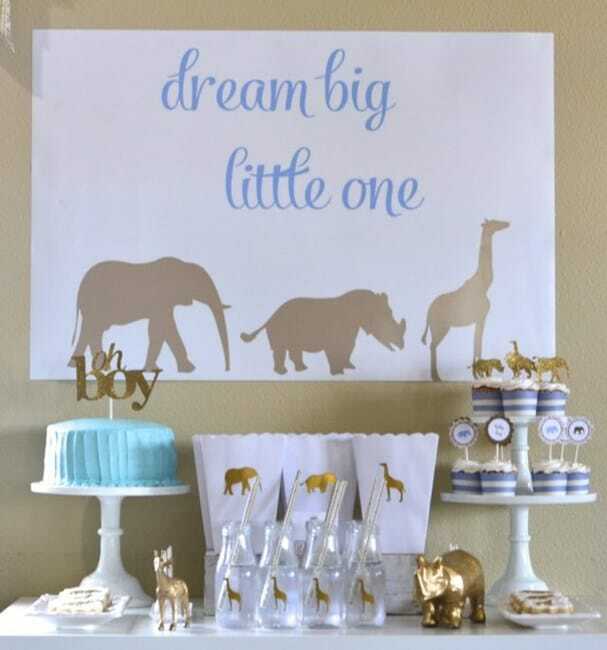 We Heart Parties has put together this adorable Safari Baby Shower with pale shades of blue, and gold painted safari animals! If you want to make sure you avoid the “tacky” baby shower things, this is a great idea. 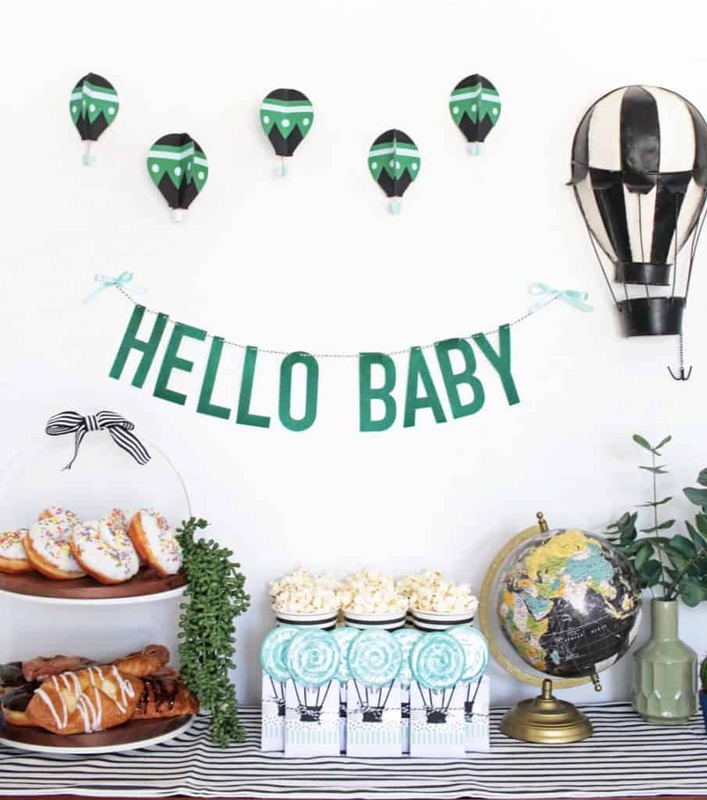 For an angle that’s a bit more whimsical but still absolutely adorable, this Mustache Baby Shower on Catch My Party is a perfect combo! For a little “wild man” to join your circle of loved ones, we love this Where the Wild Things Are theme. 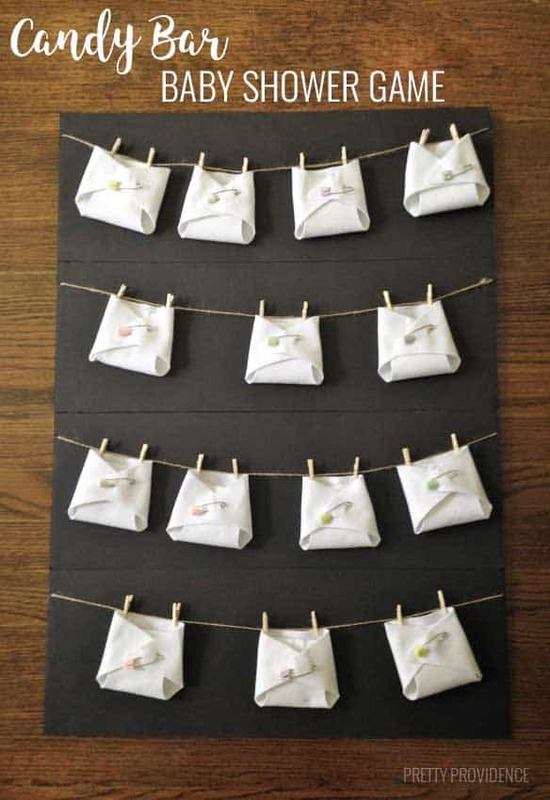 I love this simple Black and White Baby shower idea, so classy and easy to put together! Let’s start with some classics shall we? How cute does a little Whale Baby Shower Theme sound? Catch My Party has a gorgeous little gallery with ways you can pull this theme into your shower. Before we move on from Catch My Party, they’ve also got a cute gallery of ideas for a Rubber Duckie Baby Shower. 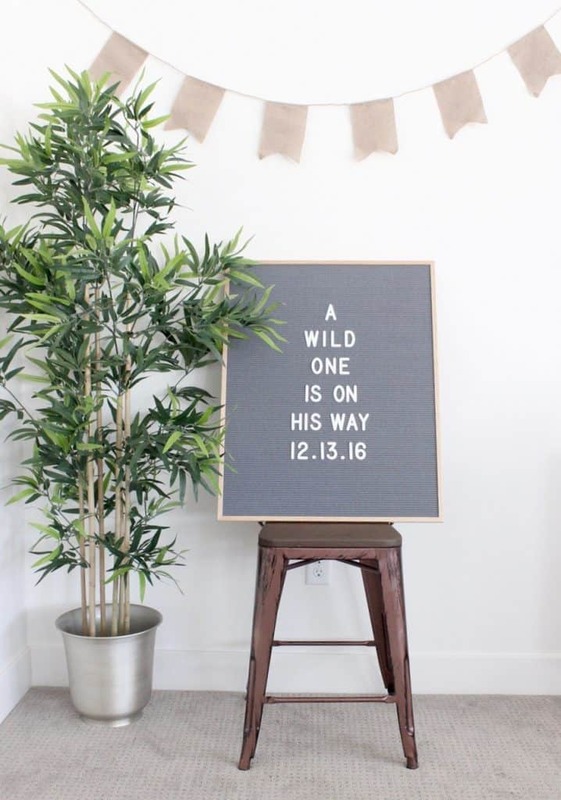 This one could even easily be pushed gender neutral if your new addition is going to be a surprise. If you do need one that’s easy to make gender neutral, this cute Ready to Pop Shower Theme is perfect. 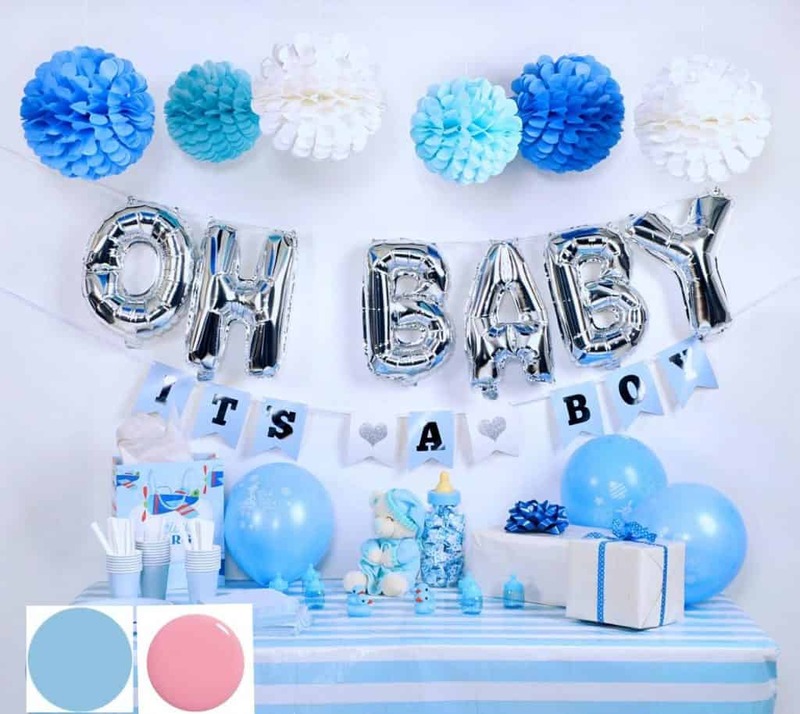 All those shades of blue are adorable, but if you want a color scheme that’s a little more unconventional, have a look at this Little Slugger Baseball Baby Shower idea. Catch My Party has created this adorable party filled with reds and navies, and would be such a fun twist on a classic. With so many decorating ideas out there, it’s hard to choose. Good thing there are so many ways to decorate a baby shower for cheap. If you have paper, a printer and a pair of scissors you can do anything! This onesie garland from Bottle your Brand is a free printable baby shower decoration that you can use with your own choice of scrapbook paper! The best kind of decor is functional decor! You’ve got to get mom-to-be a gift anyway, this adorable Baby Sock Bouquet from Grateful Prayer Thankful Heart would look so cute in the middle of your party spread, and would be a great gift for when the party is over! Of course you have to do the classic Diaper Cake right? 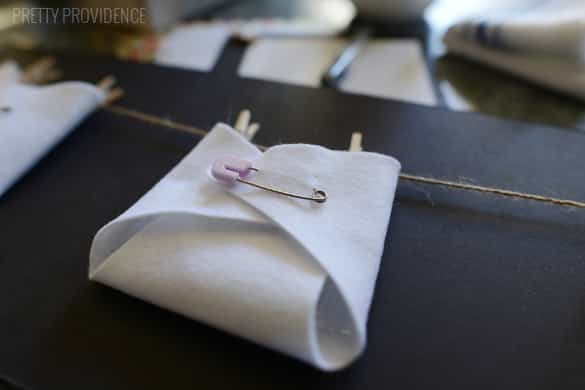 We have a simple tutorial to put together this gorgeous decoration/gift. How to Nest for Less has an amazing collection of coordinating Free Printables for a Boy Baby Shower! If all you have is a printer, some glue or tape, and a little time, you can still have an amazing shower. I love these simple Printable Table Signs from Typical Katie. All you need are a few dollar store frames and you’re in business! These are also a great starting place to make your own table signs if you want to make a few tweaks. If you don’t love making decorations at home, or you just don’t have the time, I love this blue baby shower decoration pack from Gogoshel on Etsy. Easy peasy! When you’re throwing a baby shower, food can get expensive. 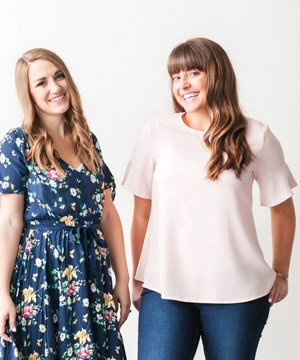 If you’re working on a smaller budget, asking friends and family to help co-host is the best way to split the cost. The time of the shower will also determine what kind of food should be served. Is it in the morning? Breakfast or brunch is a good idea. Consider all of this while you’re planning and then move on to the fun stuff – deciding what cute baby shower food to make! OK I love this idea, around here, No Bake Cookies are one of our favorite recipes. Thrifty Fun has taken these yummy treats and dressed them up in little diapers! All you need are the cookies and some festive napkins and safety pins. SO. EFFORTLESS. One of the easiest things to make for a party is jello. Mix it and forget it right? 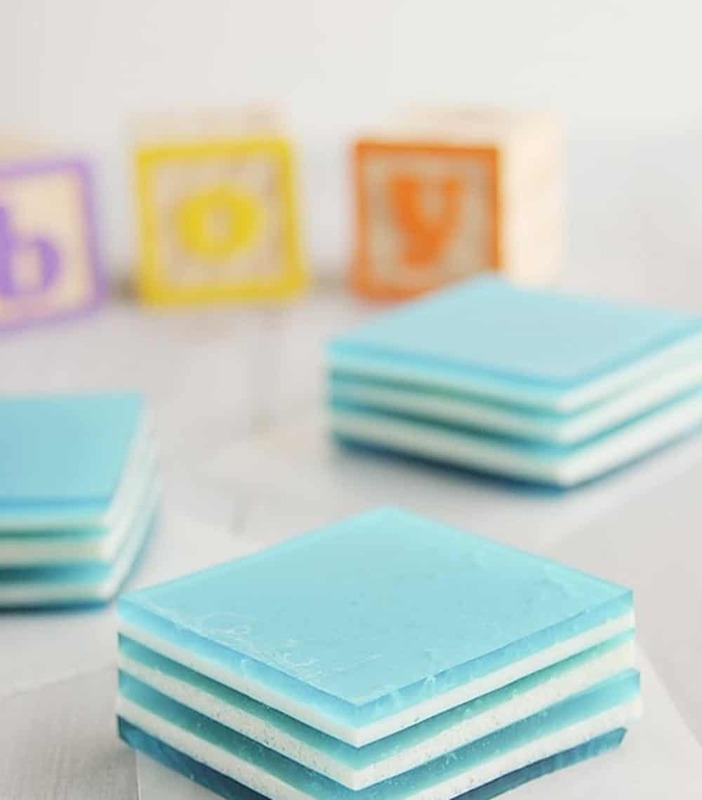 This recipe for Baby Blue Layered Jello from Taste and Tell Blog is so simple but would be gorgeous on a table scape, and would add that perfect pop of blue! Ombre is the best right? and if you can do it in an easy snack, it’s basically perfection. These Ombre Rice Krispie Treats from Brit and Co would be adorable and can easily be turned into any color that suits your shower. 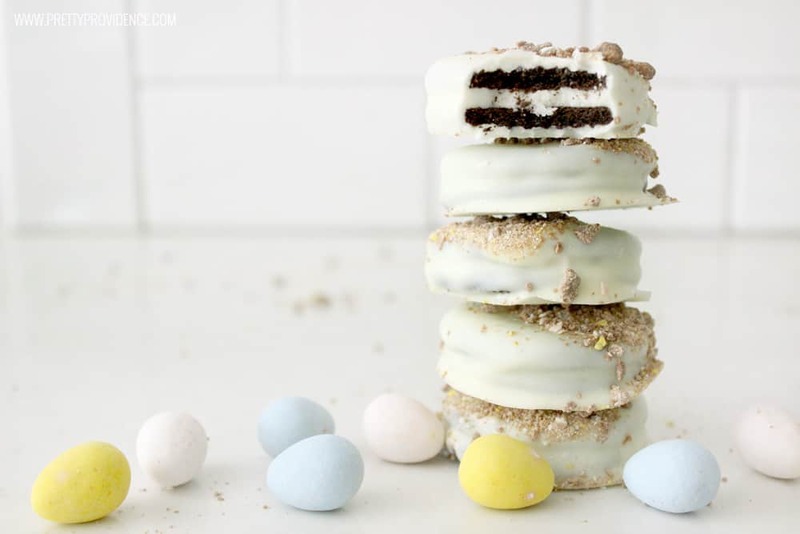 White Chocolate Covered Oreos might be just the easy, yet show-stopping your dessert table needs. She Wears Many Hats has these amazing Pretty in Pink Marshmallows, that can easily be updated with a little blue food coloring. They’re simple, and look much fancier than they are! This Onesie Cake from Bluprint looks awesome! It also comes from a regular rectangular pan and there are even pictures on pinterest of other people’s attempts, and most of them actually look like the original! If they can do it I can do it right? Try a Popcorn Topping Bar for a unique baby shower treat – it goes perfectly with a ‘Ready to Pop’ theme! Is this a breakfast or brunch shower? Do a Yogurt Bar! Toppings galore make it perfect and it’s easy for people to contribute to pot-luck style! These Bacon and Cheese Deviled Eggs are the perfect appetizer for any baby shower menu! 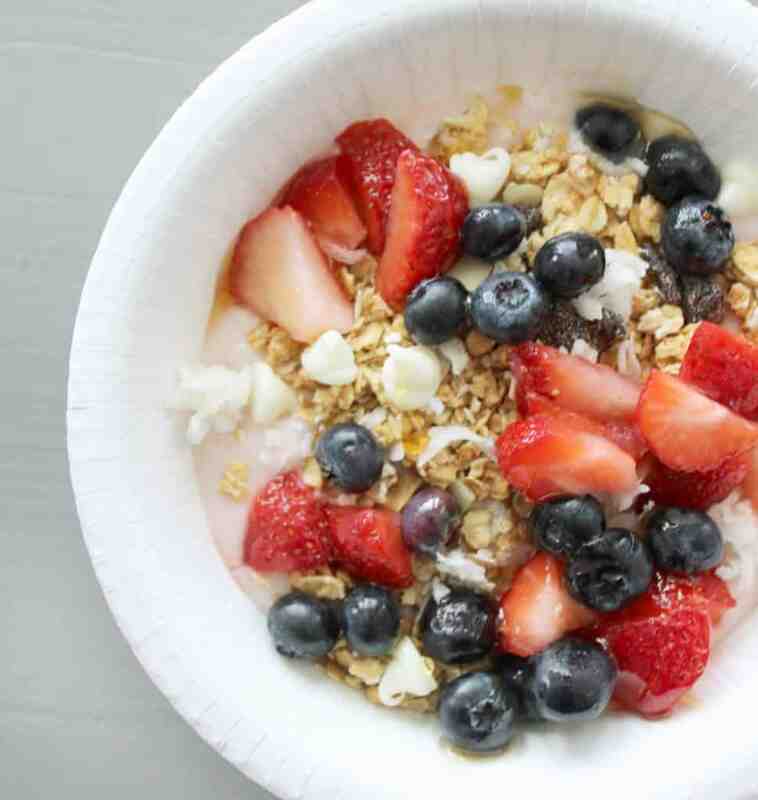 Fruit Salad is always a good idea, and this is our favorite recipe. Want something sort of substantial, SUPER delicious and really cheap for your baby shower menu? Our Best Ever Bowtie Pasta Salad fits the bill! We could eat it for days. Yum! Baby shower games can sometimes be awkward, but they can also be really fun and get the guests talking and laughing with each other. They’re usually a good idea, especially if the guests don’t all know each other well beforehand. I’ve seen variations of this Candy Bar Baby Shower Game before, but they’re usually in real diapers, and the idea grossed me out a little bit too much. Our version with DIY diapers are so cute and nice and clean, no ick-factor involved! I love this idea of a Baby Name Race from Games for Baby Showers.com! If Mom-to-be still hasn’t made her final decisions on names it might be a great way to help her out. Birds and Soap has this darling game she calls Tinkle in the Pot. Every guest puts a balloon up her shirt, and a pingpong ball between her knees, and she has to carry the ping pong ball over to a cup and drop it in without touching it with her hands! It looks like a hoot and I can’t wait to try it. One of the most classic baby shower games is guessing the stats and details of Baby! Our free Baby Shower Printable is a cute way to collect all that info to see who can get the closest. This Story Book Bookmark Favor isn’t really a game, but it’s a sweet favor for a book themed baby shower! I hope you’ve found all of these ideas to helpful and inspiring while you plan a baby shower for someone you love! The most important thing is that you have fun in the process. These are such cute ideas! So easy too! YES – glad you like them! These are really cute ideas! Thank you so much for sharing! Of course! I just love baby showers! cutest baby shower ideas ever!!! Aren’t they though!? I love them all! These are all such cute ideas!!! Baby showers are so fun. Thank you for the ideas! !